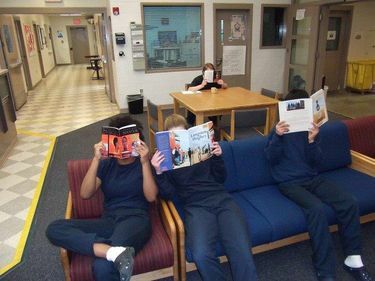 In youth detention, books can be hard to come by. But when given the chance, young inmates gobble up novels like candy. Books, those seemingly harmless rectangular objects that can open a window into other worlds, are viewed as potential weapons at some juvenile lockups. Meaning that the young inmates inside may be permitted to read only during prescribed class time, and rarely in their cells at night. That seemed counterproductive to David Domenici, who runs a nonprofit dedicated to encouraging more creativity in education at youth camps and prisons. So he pitched Scholastic on the idea of a nationwide read-a-thon, hoping that a bit of competition would jump-start the notion of reading for pleasure among kids often considered unreachable. The result is Unbound, now in its third year. Last month, Domenici and his team at the national Center for Educational Excellence in Alternative Settings counted more than 2,900 students vying for top-reader honors at 70 sites, including Naselle Youth Camp, a medium-security lockup in Pacific County. The only problem was keeping up with demand. Over four weeks the number of total minutes devoted to reading at Naselle skyrocketed, starting at 544, and ending with more than 26 hours spent burrowing into novels. “That, to me, is the definition of success,” said Kat Crawford, director of technology solutions at CEEAS. Four of the teenage residents at Naselle published book reviews encouraging other incarcerated youth to take a chance on their favorite works. Chantal Knudson, the Naselle librarian, confessed to providing candy bar incentives at first. Next month, the alternative-education group will focus on poetry through Words Unlocked, publishing a winning submission from each state. Education Lab will be keeping an eye out for work from Naselle.